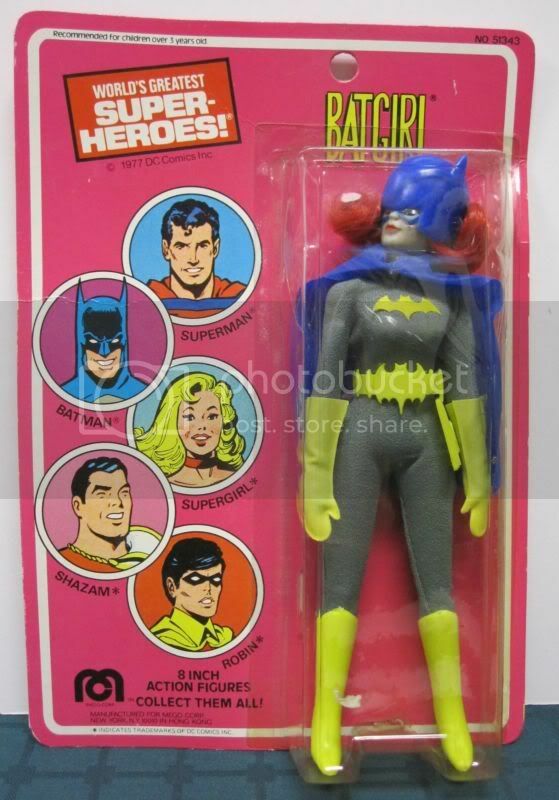 Up for auction is the ultra rare vintage Mego Batgirl. 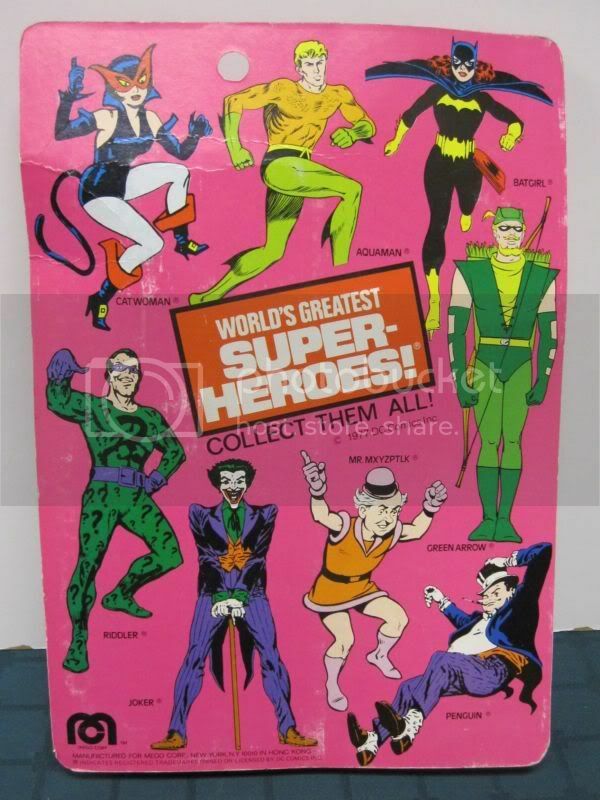 This item has been authenticated and graded by AFA (80 NM, # 10037518; 1974 Mego WGSH Loose Type I Figure / HK / Batgirl). I've decided to downsize certain parts of my collection so here's an invaluable opportunity for you to add one of the Mego collecting Holy Grails to your collection. Payment by Paypal only, please. Shipping/handling within Canada and the United States is $25.00. Please email with any and all questions. The Mego 8" BATGIRL on card dated 1977. The card is in beautiful condition, there is a small lift about 1/4" in lingth on the outer edge only of bubble rt lower corner near her foot, otherwise I don't see any distractions- it isn't even punched out at hanger. Description: Mego 8' MOC 1977 WGSH Batman Pal Batgirl ORIGINAL American Card This listing is for an American Card version of Batman's sometimes gal pal, Batgirl. ALL ORIGINAL!! Wonderful example! Straight arm version. Light shelf wear on back. Card is bright and in great shape. Bubble firmly sealed all the way around. Pose her in any action position. & helmet w/ yellow-green accessories. window. The top of the box cover also has a small tear. Description: WORLD'S GREATEST SUPER HEROES BATGIRL Action Figure. This figure in MINT on card. Card has some minor issues: mostly minor wear but top part of bubble (by BATGIRL's head) has been crushed & tiny minor crack on the bottom of the bubble (between her boots). 8" TALL. Made by MEGO, 1979, Date on card 1977. I have been doing some research through the mego museum. And according to them, this is actually a 1979 BATGIRL not a 1977, only printed on the card. Someone must have made a mistake while printing and this particular Batgirl has the greyish head that is common with 1979 carded WGSH's. This might also be the STRAIGHT ARMED TYPE 2 Figure. Because I have also looked at others like this & the heads appear to be a bit greyish. Still looks great for it's age. TOTALLY AWESOME & HARD TO FIND. Please check out the REST OF MY Vintage BAT-ITEMS, currently FOR SALE. Please check out the SCANs! Winner pays $10.00 insured shipping & handling. Buyer to pay by PAYPAL.Thanks for bidding!! SOLD AS IS. NO RETURNS ON OLD TOYS. THANK YOU. Comes in original box and encased in conservation box. Minor scuffing at corners, otherwise GREAT condition. Given a rating of 85 NM+ by the Action Figure Authority (see picture). Grading label located inside sealed conservation box. 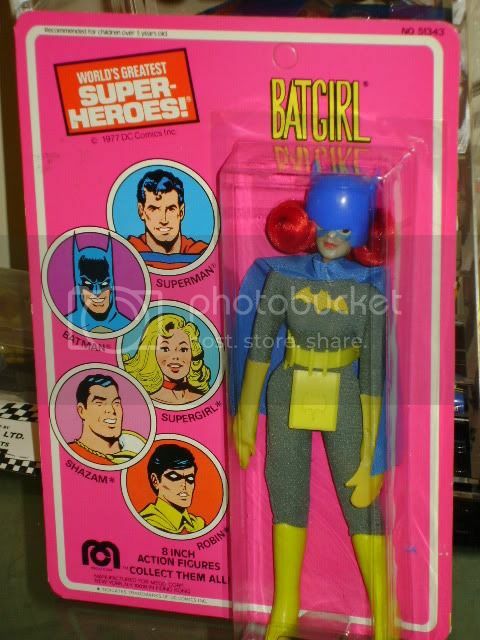 Batgirl was released in the 1974 Supergals wave along with Wonderwoman and Supergirl. The figure itself presented a unique attempt to create a Removable Cowl, the helmet is removable but the face mask is painted on. The earliest version of the figure, came with gloves, but didn't come with boots. this is a vintage mego all original supergal BATGIRL 8 inch fully poseable figure. NO REPRO PARTS AT ALL! figure has original mego cowl, gloves, boots, and belt. also, costume is clean with vibrant colors! cape is crisp and has a very nice shade of blue. head is super clean and beautiful. mego body has tight joints and last but not least - the "bat" emblem is all original vintage mego!! it would be hard to upgrade this beauty! please check out the pics and see for yourself!! buyer pays 7.95 shipping. paypal accepted. please email with any questions as all sales are final. 1977 BATGIRL AFA GRADED NEAR MINT + 85!!! MINT IN BOX, NEVER REMOVED!!! This auction is for the very rare AFA graded Bat girl Mego Figure. Figure is BRAND NEW, NEVER REMOVED FROM BOX!! !